Most of the victims are young and went to the quarry to swim or ride an ATV. 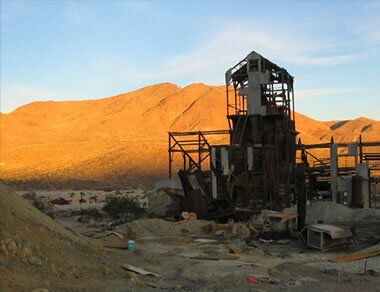 Abandoned mine structure: Structures at abandoned mine sites are often dangerous and unstable. They can also house dangerous chemicals or explosives. Stay out of these structures. Bureau of Land Management image. Abandoned mines and quarries are dangerous places! In a typical year, several people die in accidents that occur in abandoned mines across the United States. Some of these deaths can be prevented if citizens know the danger of these properties; if landowners make better efforts to warn and limit access; and, if governments have improved programs for reclaiming or regulating them. Drowning is the leading cause of death in abandoned mines and quarries. If you are a mineral collector, hiker, recreational vehicle rider, swimmer, or curious person, you have no business entering an abandoned or inactive mine or quarry. In almost every instance, you will be trespassing because abandoned mines and quarries are almost always on private property. Abandoned mine fatalities map: Deaths in abandoned and inactive mines occur across the United States. Many of them occur in the eastern coal fields, the sand and gravel quarries of the upper Mississippi Valley, and metal mines in the southwest. Image by Geology.com using data from newspaper articles and the Mine Safety and Health Administration. Examples of newspaper articles are provided at the bottom of this article. Deaths in abandoned and inactive mines occur across the United States. Many of them occur in the eastern coal fields, the sand and gravel quarries of the upper Mississippi Valley, limestone quarries in the southeast, or the metal mines in the southwest. Deadly accidents can happen in any type of abandoned mine or quarry. Stay out! Drowning is the number one cause of death in abandoned mines. Most people involved in this type of accident went to a quarry for swimming. Quarries are extremely dangerous places to swim. Steep drop-offs, deep water, sharp rocks, flooded equipment, submerged wire, and industrial waste make swimming risky. Another risk factor is the very cold water. Many quarry operations excavate to depths below the water table and use pumps to keep the mine dry while it is in operation. When mining stops, the pumps are turned off and the quarry floods by the inflow of cold groundwater. This groundwater inflow can keep the quarry water very cold even in late summer. A fall in skin temperature elicits a powerful cardiorespiratory response, termed "cold shock," comprising an initial gasp, hypertension, and hyperventilation despite a profound hypocapnia. [...] The respiratory responses to skin cooling override both conscious and other autonomic respiratory controls and may act as a precursor to drowning. Where Did This Data Come From? The data used to create the tables and map on this page was obtained from newspaper articles that we encountered in our daily readings and website reports complied by the Mine Safety and Health Administration. The actual number of fatalities is, without any doubt, higher than the numbers shown in the tables and on the map. Most deaths that occur in abandoned mines and quarries are drownings. Most of the people who drown didn't fall in by accident. They went there to swim. Don't swim in a quarry. The water can be dangerously cold, there are no lifeguards, no rescue equipment, and it is simply not safe. ATV accidents are the second leading cause of death. Quarries and surface mines are dangerous places to ride an ATV. Riders unfamiliar with the quarry can speed over a quarry's high wall or embankment. Death can result when an ATV is driven too close to a high wall and the rock, previously fractured from blasting, collapses from vibrations or weight. ATV riders have been killed by driving into wire fences at high speeds and losing control on gravel or sand-covered surfaces. ATV accidents are the second leading cause of death in abandoned mines and quarries. Stay Out and Stay Alive: Abandoned Mine Safety. Video produced by the Office of Surface Mining Reclamation and Enforcement. Falls are also deadly. Rock climbing in a mine or quarry is especially dangerous. The rock of a high wall or a mine has been fractured by blasting and can be highly unstable. The rocks that the climber depends upon for support can break free, or the climber's weight can destabilize an entire face of rock. Falls also occur in underground mines when the victim walks across rotted timbers covering a vertical shaft or steps over a ledge while negotiating a dark area. Asphyxiation typically happens in underground mines. These mines can contain dangerous gases or have low levels of oxygen. Some victims have not realized that they were inhaling dangerous air until it was too late. Other causes of death include electrocution, passage collapse, and rockfalls. Today all mining operations must be reclaimed when work is completed. Miners are expected to return the land to a condition similar to before the mining was done - or in an alternative condition specified in their approved mining permit. To assure that reclamation is done, the mining company must post a performance bond. The bond money is used to reclaim the land if the mining company goes bankrupt or fails to reclaim the land as required. Sometimes there is not enough bond money to complete the reclamation work, and that work goes undone. Many abandoned mines were closed long before permitting and bonds were required. The responsibility to reclaim these mines can fall to the current property owner or to the government. Reclamation is expensive, so many of these jobs have not been completed. Abandoned iron processing facility in England: The abandoned mines problem is not confined to the United States. Open pits, underground mine entries, mineral processing facilities, and other abandoned works can be found in all parts of the world. 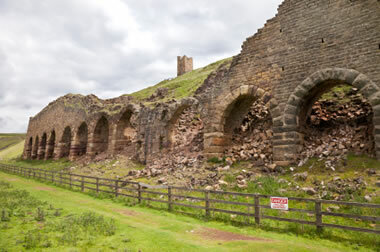 The photo above is of an abandoned iron processing facility in North Yorkshire, England. Photograph copyright iStockphoto / PaulaConnelly. The buildings, structures, and equipment left at abandoned mines are also dangerous. The buildings and structures can be old and unstable. Floors can collapse when they are walked on. Supports can be rusted away. Chemicals, explosives, or electrical equipment and other dangers are sometimes left inside. Don't explore equipment and structures at abandoned mines. Underground mines are especially dangerous. They are dark inside, have loose rocks on the walls and roof, and there can be deep shafts and tunnels concealed by rotten wood covers. Underground mines are often used as homes by bats, bears, snakes, and other dangerous animals. The victims range in age from preschool children to an 85-year-old mining veteran. Abandoned mine accidents claim the lives of people of all ages. Children sometimes enter mines without supervision, and adults sometimes take children with them when entering an abandoned mine site. A table on this page shows the age distribution of abandoned and inactive mine deaths. Most victims are young and die by drowning. Older victims die from a variety of causes. MSHA educational books: The "Fatalities by Age" chart on this page shows that young people account for most of the fatal accidents. The Mine Safety and Health Administration has produced educational materials appropriate for school-age children. Dangerous mining sites should be reported - especially if you know that there are dangerous activities going on there. You can start by reporting to your local police. Another good place to report is the Office of Surface Mining's contact list. Help educate people in your area about the dangers of abandoned mines. One life saved is worth a lot of effort. The data used to create the tables and map on this page was obtained from newspaper articles that we encountered in our daily readings and website reports complied by the Mine Safety and Health Administration. The actual number of fatalities is, without any doubt, higher than the numbers shown in the tables and on the map.